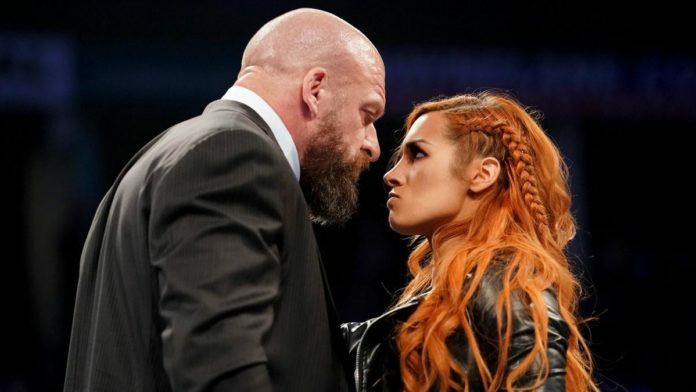 Former WWE SmackDown Women’s Champion Becky Lynch taunted Triple H and Stephanie McMahon after sharing the ring with them on this past week’s episodes of Monday Night RAW and SmackDown Live. It all started after Lynch was “medically suspended” by Stephanie, who was later attacked by SmackDown star. Then, on Tuesday’s SmackDown Live, Lynch had an exchange with “The Game” to start off the show and later slapped him. The storyline is that Lynch won’t be allowed to challenge WWE Raw Women’s Champion Ronda Rousey for the title at the WrestleMania 35 if she’s not cleared by a WWE doctor to compete again. Asuka successfully defended her WWE SmackDown Women’s Championship against Charlotte Flair by submission to win the match, which served as the dark main event on Tuesday night at the SmackDown Live TV event in Everett, WA at the Angel of the Winds Arena. It should be noted that Asuka didn’t appear on Tuesday’s episode of the blue brand.